Don’t you just love the world wide web? I certainly do. I just find it mind-blowing the abundance of knowledge and information at our fingertips. Take, for instance, this kansi. I am a Kapampangan from Tarlac and I’ve never been to Iloilo in my life. But due to the encompassing internet, I don’t have to travel all the way to Bacolod City to experience and learn how to make one of their classic soups. Today was, in fact, the first time I’ve made kansi and judging by my contented sighs after lunch, it certainly won’t be the last. With fork-tender beef and meaty green jackfruit in a hot and sour broth, it’s comfort food at its best! I enjoyed it so much I might have just eaten my weight in rice. 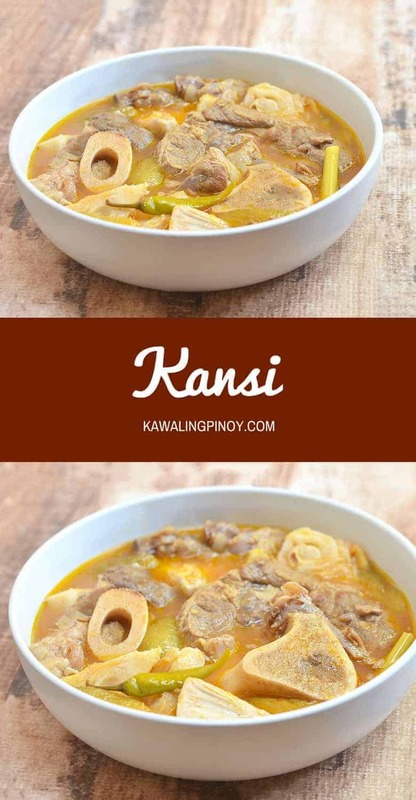 Kansi has been likened in taste to the traditional sinigang but that, I think, is too basic of a comparison. The two may share the same sour notes but the flavor profile of the former is a lot more complex due to the addition of lemongrass and atsuete. 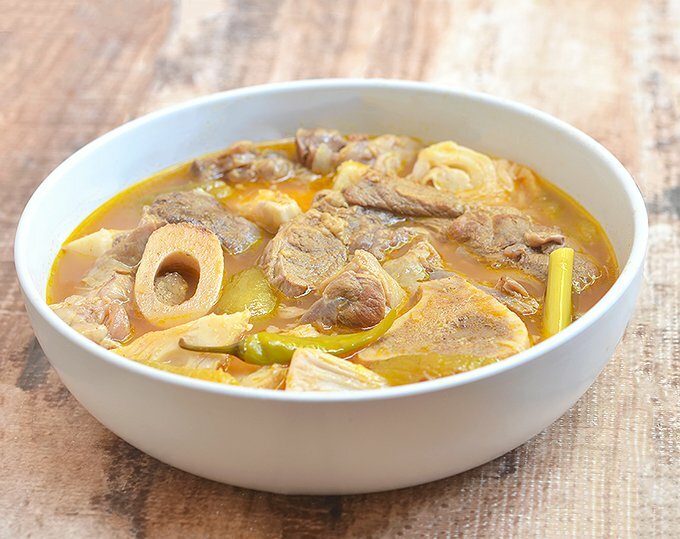 Ingredients for this Ilonggo delicacy also include green jackfruit, chili peppers, and batwan which is a fruit native to Western Visayas traditionally used as a souring agent in dishes such as KBL (Kadyos, Baboy at Langka) and pinalmahan (Ilonggo-style paksiw). Since batwan are hard to find outside of the Iloilo area and near impossible to get here in California, I substituted kamias and a package of tamarind powder to flavor the broth. Beef shanks are what’s primarily used to make kansi but I imagine pata (beef leg) will be a good cut to add as well for an extra layer of texture and flavor. 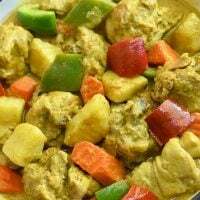 I also used green jackfruit in the can which is pretty much ready to eat so please adjust the suggested 10 to 15 minutes additional cook time to about 20 to 25 minutes if using fresh langka. That’s it, folks! Enjoy and keep warm. 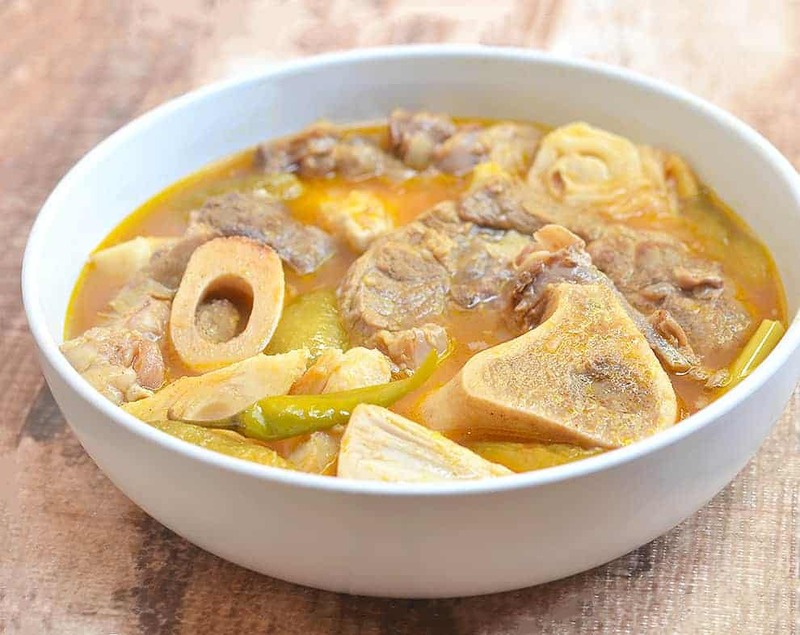 Wash beef shanks well to remove any blood or impurities. Drain well. Peel the outer layer of the lemongrass stalks until you reach the pale central core. Cut into 3 to 4-inch lengths and with the back of the knife, lightly pound each piece. Set aside. In a deep pot over medium heat, heat oil. Add garlic and cook, stirring regularly, until limp. Add beef shanks and cook, turning as needed, until lightly seared. Make sure not to burn the garlic. Add water and bring to a boil, skimming scum that floats on top. When the broth clears, add onion. Lower heat, cover, and simmer for about 1½ to 2 hours or until meat is fork-tender. In a small bowl, combine annatto powder with about ½ cup of the broth. Stir until annatto powder is dissolved and return broth to pot. Add tamarind soup base. Stir to disperse. Add lemon grass, green jackfruit, kamias, and chili peppers. Continue to cook for about 10 to 15 minutes or until jackfruit pieces are heated through. Season with salt and pepper to taste. Serve hot. Looks delicious! Is manias and annato powder sold in Filipino grocery stores in California? I’m from bacolod and I sooooooo miss this. So I made this last night and it was so good! I didn’t have ka isa though, just the good ol sinigang mix powder. Thanks for sharing this recipe. I am an expert with this dish😀. I bring batwan with me to Cali whenever I go home for a holiday. It’s the secret to this dish. The authentic dish is not langka though but “Kamansi”. It looks like langka but smaller and round similar to “marang fruit’. And With kamansi, beef pata is better.I broil my pata first before simmering and it gives you great flavor. My favorite dish ever!